This news item was posted in Breaking News, World News category and has 1 Comment so far . Millions of Muslims have gathered at Mina to perform rituals of Hajj, a major obligatory annual religious undertaking, for this year, news reports. 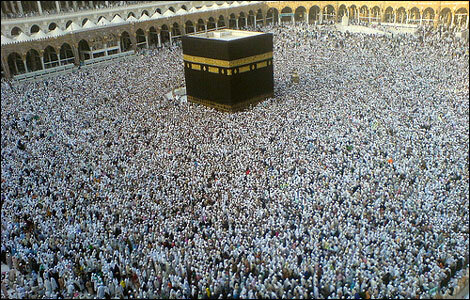 Over two million Muslims have gathered from around the world in Saudia Arabia to perform Hajj. On eighth of Zil-Hajj, Hajj rituals have officially started in holy cities of Makkah and Madina. Over 2.3 million Muslims have established a city of tents in Mina at beginning of Hajj rituals this night. These all Muslims, belonging to different countries and backgrounds, will stay whole night in Mina together and would continue worshipping and begging for pardon to God. Early in the morning of ninth Zil-Hajj, these Hajj pilgrims will perform Fajar Prayer and then move towards Arafat to perform Waqoof-e-Arfa (major ritual of the Hajj). Imam of Nimra Mosque will deliver his sermon to Hajj pilgrims in Arafat and they would perform Zohar and Asar’s prayers jointly there. Later on, they would move towards Muzdalafa and there they would perform remaining two prayers, Maghrib and Isha, together. All Hajj pilgrims will stay whole night in Muzdalfa and continue worships for forgiveness and pleasing God, the almighty. They would perform Fajar prayer on morning of 10th Zil-Hajj in Muzdalfa and then return to Mina for following act of Hazrat Ibrahim (AS), stoning the big Satan. After stoning the Satan, Hajj pilgrims will shave off heads or trim hairs, to the prescribed level, and then would get off the Ahrams, Hajj cloths, at completion of Hajj rituals. Muslims celebrate Eid-ul-Adha and sacrifice Halal animals of their choices every year, after completion of Hajj proceedings.